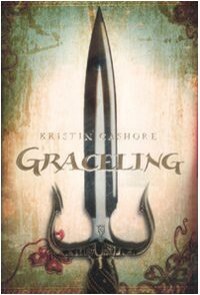 Graceling - The More I Read. . . True confession: I've only read a middling amount of fantasy and YA (when I grew weary of the 'same old same old' historical romances about two years ago, I read only YA.) But. . . I've never read The Hunger Games despite my sister's best efforts at forcing/cajoling/whining/bribing to get me to, nor have I read any of the Harry Potter books (again at my sister's urging). Yes, I know these books were/are popular, but the more they were pushed on me, the more I resisted (which is childish, I know), but honestly my interest just wasn't piqued. I'm more a pick and choose, 'cafe'-type fantasy/YA reader. I need to be curious or intrigued about a certain aspect before jumping in. I began reading Graceling not out of piqued interest but as a way to read and understand Fire better, a stepping stone to the book I really wanted to read, a necessary evil, if you will. 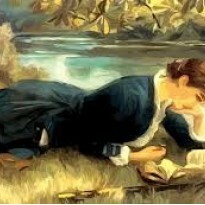 But I fell in love with Katsa on page 9, when she discovers at age eight that her 'Grace' is killing. Up to that point she already lived in a degree of isolation because she has no family, no sisters, no brothers. Packed off to her Uncle Randa's court because of her dichromatic eyes signaling her 'Graceling' status only added to her isolation, finding herself disliked at worst and merely tolerated at best because of her kinship with the king. The reaction of all the guests is horror and shock, unanimously feeling that those graced with amazing abilities to cook or cure sick animals or swim faster and longer than anyone else is one thing, but 'a girl Graced with killing (...) was not safe' and must be kept separate from others. King Randa sees at once how useful Katsa can be to him and punishes her not with banishment or execution but with further isolation, keeping her in her chambers for weeks. Were it not for the suggestion by Raffin, her cousin, closest friend, and the King's son, that she learn to 'control her Grace' with the king's captain of the guards and spymaster, Oll, I'm not sure what would have happened to Katsa. When she emerges from her rooms, another layer of isolation has been added, and even worse, from that point forward King Randa manipulates her into believing she's no better than animal, his 'Lady Killer.' Katsa is openly feared, shunned and forced to live with the ensuing isolation for years. Most people run from her, refuse to meet her eyes, treat her as some kind of monster. Though Katsa's isolation leaves her emotionally underdeveloped, it also fosters her great sense of independence and self-reliance. Her independence makes itself known in the way she dresses, her fierce competitiveness, her strong will, her vow to never marry and never bear children. To a young woman who realizes her power is hers for the reclaiming and cannot be taken from her unless she consents to having it taken from her. Feeling vulnerable and powerless, despite her subversive efforts in heading up a clandestine Council which tries to right wrongs and aid those who need it, Katsa hasn't had much luck with gaining the upper hand with King Randa. Taking back her power and control and choice are all entangled in her journey, and it's Po, Prince Greening Grandemalion, another Graceling with one silver eye and one gold, who sets her on that course of self-discovery. It's with Po's guidance and insight that Katsa sees the root of her uncontrolled anger and discovers her true nature and Grace. Po's Grace, the ability to sense other's thoughts and feelings, is the key to Katsa's reclaiming her power from her uncle, because he knows Katsa is more than her uncle's possession, his killing machine. Po's nurturing attitude and patience with Katsa stems at least in part from the benefits and expertise with his Grace, but their friendship is the foundation, the building block, for her to really set herself free. Po is wonderful! I'd like to just leave it at that, but he's such a big part of why I love this book. I loved what his character has to say about masculinity and femininity and how those things we think mean 'feminine' or 'masculine' really don't or shouldn't matter as far as gender identities. I loved the way he opens Katsa's eyes to reconciling her dual nature - the 'monster' who kills/maims for her uncle with the part who is horrified and repulsed by the violence she does. Just as Katsa, her uncle's assassin, the commitment-shy young woman who dresses like a man, who feels constrained by long hair, dresses, and jewelry, who subverts her workroom into a weapons room, who vows never to marry, who 'panicked at the thought of a baby at her breast or clinging to her ankles' turns the traditional heroine upside down, so, too, does Po rattle the cage of a stereotypical male role. As a Lienid male, Po is definitely a peacock, wearing rings, earrings, decorated with tattoos, though the tattoos are hidden from just anybody and carry a more personal signification. I loved the family connection with his rings. Po, unlike Katsa, wants the long-term commitment, and he's much more in tune with his emotional self. He's also a skilled fighter but ...not as good as Katsa. That she's a better, stronger fighter is not something that particularly bothers Po. He's neither humiliated nor threatened by a woman who can regularly pummel him, who's a better hunter, who can start a fire even in a thunderstorm, and if she's offering protection he accepts gratefully. I loved the idea of mutual acceptance of their differences as part of the people they are, rather than defining who/what they are. In fact the only time I saw Po as weak was when he closes himself off emotionally from Katsa, doing his best John Wayne impression, locking her out and shutting her down to keep her from finding out what's going on behind his mask. It felt so alien to his character that I was initially confused why this bothered me so. After all, he was behaving in a way a lot of male characters do in romances I've read - characters I've found fascinating and attractive in many books to be honest. But strength doesn't have to mean 'I'll shoulder this burden on my own because I am in control, and I don't need your help.' Being silent is good when you're listening, but it can be as deafening as a scream when it's used to shut off communication. Thankfully, this didn't last too long. In this world, a Grace is both a blessing and a curse, with a dark and a light side, a duality within the person but outwardly manifested in two different eye colors and a superior facility at some task. Each Grace seems unique to the individual and mastering or controlling the Grace is very much individualized. Both Katsa and Po had things to learn about exerting or letting go of control, how it helped them embrace and master their respective Graces. Katsa had to learn to rein in her anger, exert more control, in order to master her Grace while Po needed to relax the reins to fully experience his. Nothing about Graceling is 'typical', and I loved that Katsa and Po are at peace with their decisions about their future at the end despite what others say or think. The friends-to-lovers romance between Po and Katsa was a wonderfully executed though I felt the story dragged a bit during Katsa and Princess Bitterblue's trek across Grella's Pass. My impatience stems, I think, from Katsa having to leave an injured Po behind and, because Graceling is all Katsa's POV, there's such a long stretch in which I knew nothing of his fate and couldn't help wondering what was happening to him at the cabin. The villain makes only a couple of appearances so his threatening presence is maintained more by indirect means (rumors, stories, etc). I would have liked more backstory on him, however, because he seemed a little undeveloped. I do hope there's more on Prince Raffin and Bann in Bitterblue. I hope to see the results of Katsa returning to the Middluns and facing King Randa, making her declaration of independence, letting him know for once and for all that she's neither 'scared of him' nor 'scared of [her]self.' I'm anxious to learn what changes are in store for Princess Bitterblue and Monsea. I love the simple elegance of Ms. Cashore's writing style here that has a tad medieval feel to it and yet flows so easily and naturally as well as the almost perfect mixture of suspenseful and sinister goings-on balanced with a dollop of laughter now and then to ease the tension. Alice Walker is attributed as saying 'The most common way people give up their power is by thinking they don't have any' and this statement echoes on each and every page of Graceling. I love the message that no one takes your power away without your consenting to give it away first, a power that's there even when you don't consciously recognize it. Graceling's almost philosophical way of looking at power, choice, control, and autonomy are thoughtful and positive, as well as being able to knock fictional gender stereotypes on their asses. I began Graceling as a means to an end, but I closed the book in love with the characters and their world and wishing I had just one more page to read.